Temperature-sensitive goods, often of a high value, are stored in refrigerators in pharmacies, hospitals, laboratories, doctor’s surgeries and supermarkets. If the goods are rendered unusable by a refrigerator breakdown, this can lead to major losses and considerable costs. The testo Saveris 2 WiFi data logger system offers you the ideal solution for temperature monitoring in refrigerators. 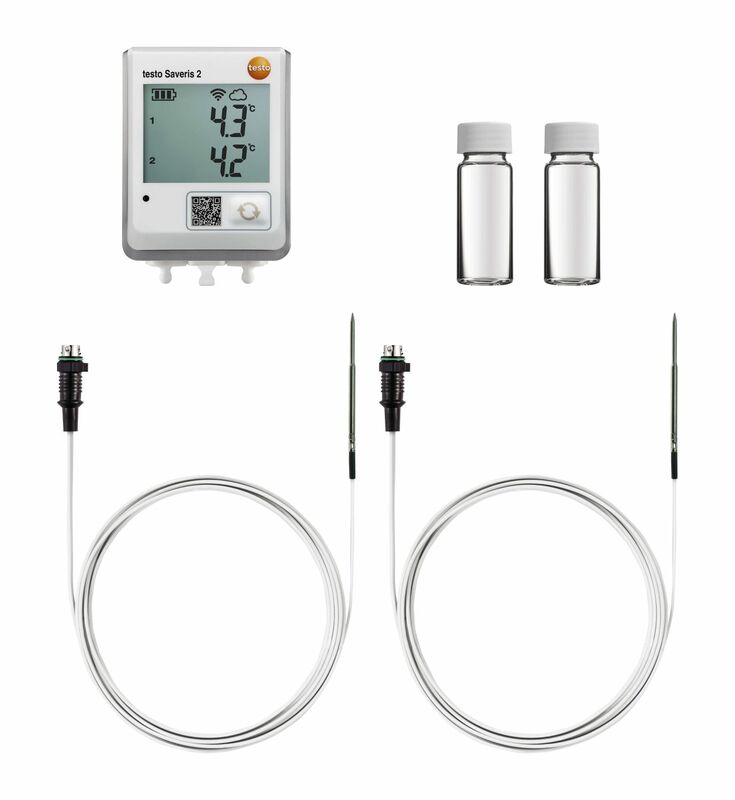 The testo Saveris 2 WiFi data logger system enables temperature monitoring to run automatically: you do not need to note down any min./max. values, read out data loggers or sort the measurement data then save them. All the measurement data are transmitted wirelessly to the Testo Cloud and automatically archived there. You can access them at any time with your PC, smartphone or tablet, in order to check the values or to provide proof to auditors. Thanks to access to an API interface, you can export the measurement data to your system. The set also includes two flasks for filling with a suitable temperature buffer. As soon as the temperature probe is immersed in the filled flask, the temperature buffer insulates the temperature probe and slows its response time. This makes sense in order to avoid false alarms when monitoring temperature in refrigerators. Short-term temperature peaks (for example due to doors being opened) are of no consequence. The temperature measured corresponds to the actual temperature of the stored goods. Propylene glycol is for instance suitable for temperature monitoring in refrigerators; ethylene glycol is recommended for applications in freezers below -20 °C. - 2 x temperature simulation flasks for filling with a temperature buffer suitable for each respective area of application.